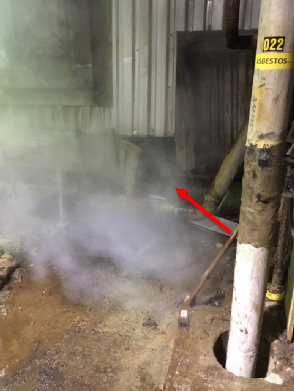 A severe tube rupture occurred on a high pressure steam boiler which was operating at 750 pounds per square inch shortly following a warm-up period on start-up. 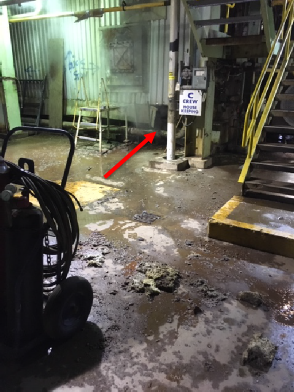 A catastrophic tube failure caused a release of a significant portion of the 40,000 liters of water in the boiler in approximately one minute. The inside of the entire four storey boiler building was engulfed in high temperature steam. No one was inside at the time of the release. The boiler house is typically occupied by shift operators. 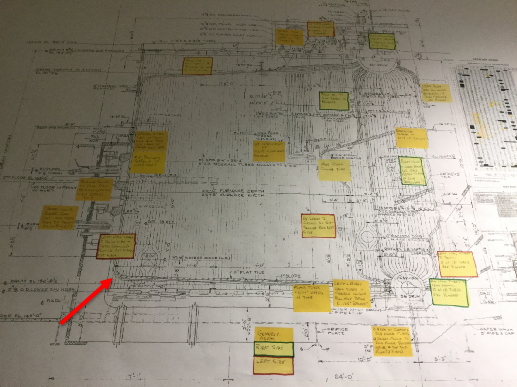 The design of a boiler should take into account eliminating high stress/strain zones that could lead to stress accelerated corrosion (SAC). The owner must maintain a water treatment program to control the oxygen content in the boiler water at or below the 5 parts per billion as recommended by industry standards to mitigate SAC. Inherent stress/strains and thermal cycling. Expansion and contraction between the walls and floor of the boiler, induced stresses on the sweeping elbow tube at the attachment weld. These stresses are typically greatest during start-up due to thermal expansion. It is likely that adequate control was not maintained of the oxygen content in the water in accordance with industry standards in the earlier years of this boilers life. Stress accelerated corrosion (SAC) progressed over the 51 year life leading up to the rupture. SAC likely accelerated during the last 21 years when the boiler was being used as back-up due to repetitive thermal cycling. On October 11, 2018 at 16:20 the high pressure power boiler was fired-up and a 12 hour warm up period commenced. The main steam valve was opened 1 hour prior to the rupture to provide steam to the mill. Steam conditions were stable at 750 pounds per square inch and 3175 pounds per minute. A toolbox talk scheduled for 05:15 on October 12, 2018 delayed two workers from performing routine tasks inside the boiler building. During the safety meeting, the water level was lost in the steam drum at 05:31 due to a catastrophic tube failure. The control room engineer tripped the boiler burners shutting down the boiler. There was no one in the building at the time of the release. The location of the rupture was at a routinely travelled access/egress route. The boiler was put in-service in 1967 and has been operated as a back-up boiler since 1997. It runs as-needed approximately 20 days per year with a wet layup when its off-line. There is currently a chemical water treatment program for when the boiler is layed-up and when it is being operated. Sodium sulfite is used as an oxygen scavenger during boiler operation with testing done to ensure its effectiveness. There is no specific testing done for oxygen content in the water. The details of the water treatment program in the earlier years of the boilers life are unknown. The deaerator was last inspected in 2017 with no significant issues found. The material of the 3” sweeping elbow is SA-210. No evidence could be collected to determine the finished condition of the elbow but it’s believed that the elbow was cold formed. 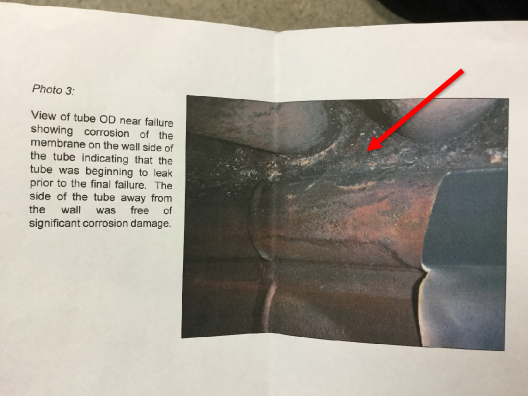 Stress accelerated corrosion (SAC) can be described as a localized failure of a nominally protective magnetite (Fe3O4) film resulting from mechanical and/or thermal stresses on the tube, thus permitting the corrosive medium – in this case, high temperature water/steam inside the boiler tubes to access the substrate to advance steel corrosion at the location of film failure. Stress accelerated corrosion requires critical values of both oxygen and active strain to overlap in time. Boiler used as a back-up in its latter half of its life with repetitive start-ups for approximately 20 years causing stresses due to thermal cycling. Likely poor control of oxygen content in the water through the earlier parts of the lifecycle of the boiler. Inherent stresses at the corner of the boiler where the floor tubes meet the wall tubes. Inherent strain from the attachment weld to the tube. Likely inherent strain from the cold formed elbow. 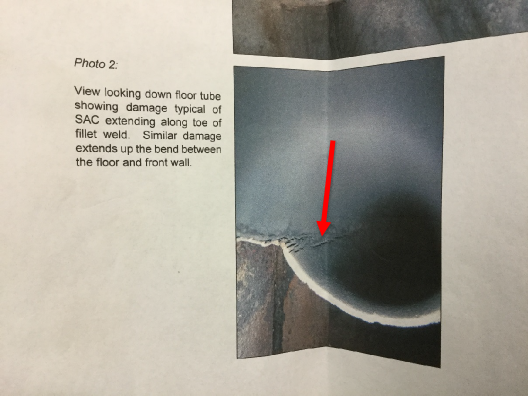 No previous inspection or non-destructive testing at the location of the tube failure. 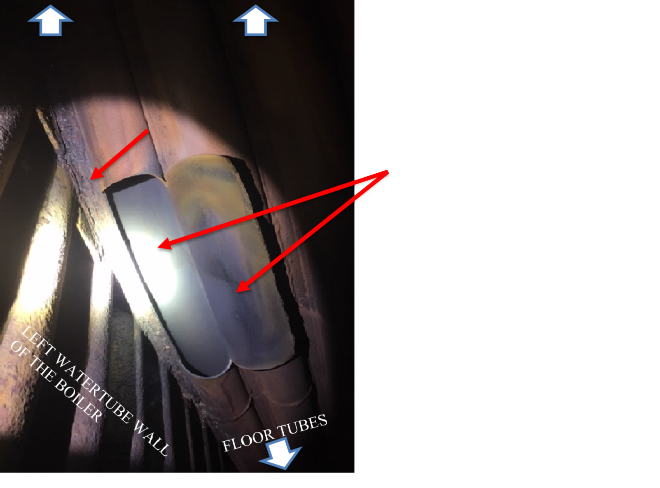 The integrity management program did not address stress accelerated corrosion adequately. Area is not easily accessible for testing/inspection. Previous annual pressure tests did not reveal this damage. Damage description: Tube one ruptured at the sweeping elbow transition between the front wall and the floor tubes leaving an approximate 12” by 3” hole. The insulation and cladding covering the tube was blown off. 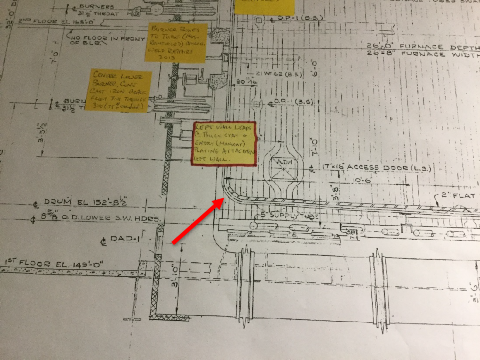 Location of failure on boiler drawing (close-up). 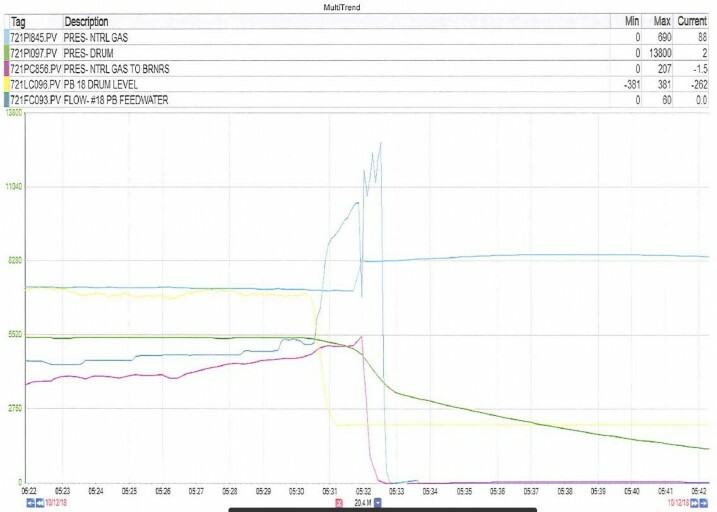 Boiler variables at the time of the incident.